A general view shows the scene of a suicide car bombing outside Hotel Ambassador on Maka Al Mukaram Road in Somalia's capital Mogadishu, June 1, 2016. Witnesses in Somalia's capital say at least 10 people were killed and more than 15 others wounded when militants attacked a major hotel Wednesday. Somali lawmaker Mohamed Ismail Shuriye told VOA that two parliamentarians, Abdullahi Jama Kaboweyne and Mohamud Gure, were killed during the attack. He said a third lawmaker, Abdullah Hashi, was injured. One of the lawmakers at the hotel described the attack, saying: "As I was sleeping in my hotel room, I was shocked by a huge explosion. A flying door and window fell on me. I ran toward the back door of the hotel and managed to survive," he said. Abdullya Haji Dayib told VOA that he rushed a friend to the hospital, where he saw ambulances bringing dozens of wounded people for treatment. A freelance journalist working for VOA reported seeing five dead bodies lying in front of the hotel. Most of the casualties were reported to be caused by a car bomb that detonated while many people were performing evening prayers. Wrecked cars burn at the scene of a terror attack at the Ambassador Hotel, after a car bomb exploded on June 1, 2016 at a top Mogadishu hotel that houses several MPs, killing several people, and followed by a gun battle. The assault on Mogadishu's Ambassador Hotel came hours after Somali officials said a top commander of militant group al-Shabab was killed in a late-night military operation. Mohamed Mohamud, better known as Dulyadeyn, allegedly masterminded the April 2015 attack on Kenya's Garissa University College that left 148 people dead, nearly all of them students. Dulyadeyn was killed in southern town of Bula-Gaduud, about 30 kilometers north of Kismayo. There are conflicting reports about the circumstances of his death. A senior Somali official, speaking on condition of anonymity, said U.S. helicopters fired missiles into a car in which Dulyadeyn and two others were traveling. A security minister in the Jubba region, Abdurashid Janan, told VOA Somali that the militant was killed by a U.S.-trained Somali commando unit known as Danab, or lightning. U.S. officials have yet to comment on the attack. The Pentagon Wednesday reported a separate airstrike in south-central Somalia on May 27 that targeted Abdullahi Haji Daud, a senior al-Shabab military commander and attack planner. Pentagon Press Secretary Peter Cook says the U.S. is currently assessing the results of that attack. 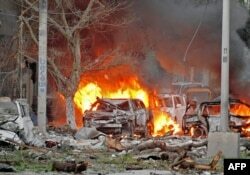 In Mogadishu, the assault on the Ambassador Hotel began with an explosion outside the hotel late Wednesday afternoon. Gunmen then stormed inside. Government security forces entered the building and have been moving floor to floor, trying to clear out the attackers. The hotel is used by Somali lawmakers, businessmen and visitors from abroad. No one has claimed responsibility for the hotel attack but suspicion fell on al-Shabab, which has attacked several other Mogadishu hotels in a similar manner. The attack came less than a day after the operation in Bula-Gaduud that killed Dulyadeyn. Frightened residents of the town said they heard the sounds of fighting overnight Wednesday. Both the Kenyan and Somali governments had offered rewards for Dulyadeyn. Somalia-based al-Shabab has been fighting to install a strict Islamic state in Somalia since 2006. U.S. troops are not officially involved in combat but play an "advise and assist" role with Somali government troops and the African Union force fighting al-Shabab, known as AMISOM.